I usually don't buy cookbooks. I get most of my recipes online, from the list of bloglist that I follow. But I made an exception and bought Ree Drummond's The Pioneer Woman Cooks. I have been a follower of her cooking blog for quite some time now, and I love it. The recipes she usually posted are simple, high-cal and wholesome. Just the way I like them. I just got this book less than a week ago. Bought it from Amazon through Leo Bookstore. Could not find the book in any bookstore. This is the first recipe I tried out in her book. One of her most simple recipes in the book I think. 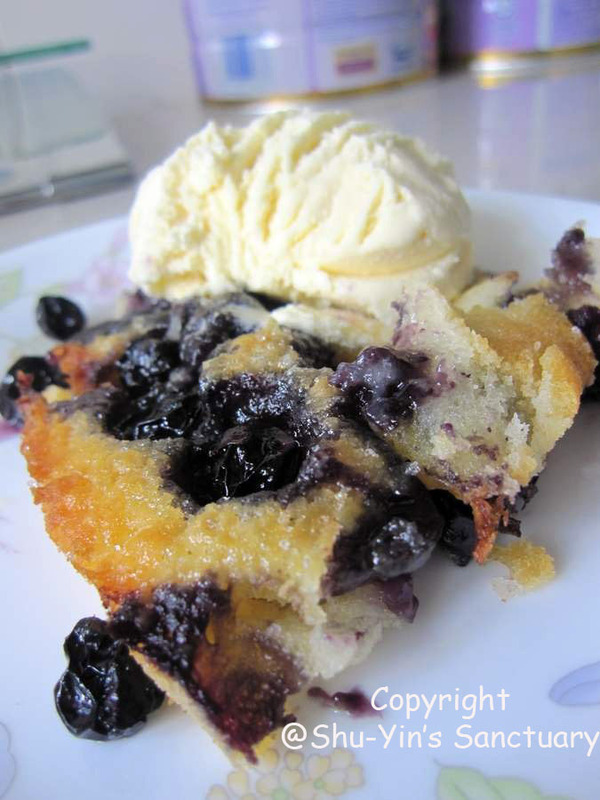 In her book, it is stated as 'Patsy's Blackberry Cobbler'. 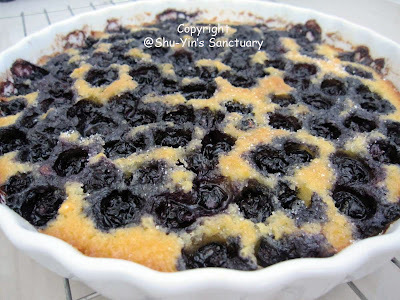 Since I changed the fruit to blueberries, I think Blueberry Cobbler is a more suitable blog title for this post. I halved the recipe to fit the cobbler into my small 1-quart baking dish. The ingredients needed are minimal (only butter, sugar, flour, milk and blueberries), steps are simple and needed no time at all to prepare. Within minutes, I have my cobbler dish ready to be put in the preheated oven. As you can see, I sprinkled a generous amount of blueberries on top of the batter. 30 minutes later, this is what I get. Blackberries obviously make a more presentable dish. 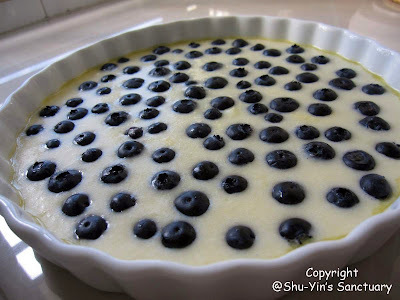 Blueberries seem to shrink and wrinkle after baking. But let me tell you this. 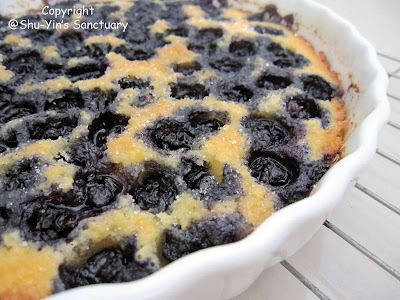 The blueberries version is simply delish! The crust is crispy at the edges. Texture of the cobbler is rather bread-like, more than cake-like to my opinion. But the winner is the juicy sweet blueberries. 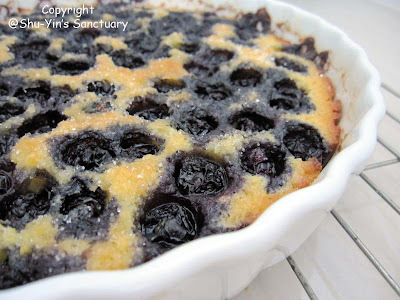 When sprinkled with abundance into the cobbler, they sure feel juicy! And when topped with vanila ice-cream, was simply irresistable. Try this recipe at home! It is the most simple dish i've ever baked! Baked this at night and both hubby & I ate the whole thing for supper. Haha. Actually it is not that big with thin crust. But it was a sinful supper. I still have two packets of blueberries left. 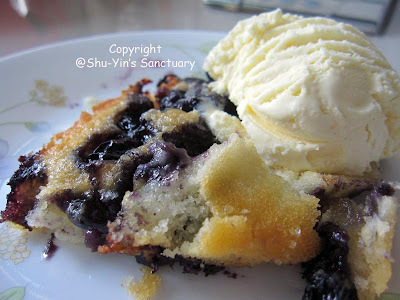 Will be baking this again for family to try tomorrow. 1. Preheat the oven to 180 d celcius. Grease a 1-1.5 quart baking dish. 2. Place the butter in a microwave-safe dish. Heat in a microwave for 30 seconds, until melted. 3. In a medium bowl, whisk 1/2 cup of the sugar with the flour and milk. Where do u get the blueberries from? Are we supposed to use fresh blueberries? u can use frozen or fresh strawberries. i got the fresh strawberries from tesco. 125g for rm8 i think. u can use frozen or fresh blueberries. i got the fresh bluerries from tesco. 125g for rm8 i think. yeah, i figured you meant blueberries... no worries. karen...although so but i find the frozen ones sometimes are frozen in lumps, although they claimed to be IQF quality (individually quick frozen). I guess it is our climate during delivery. once frozen in lumps, it is difficult to separate them, resulting in squashed berries. becky...they not only look good, they taste good too. Will try it out soon. Thanks for sharing.